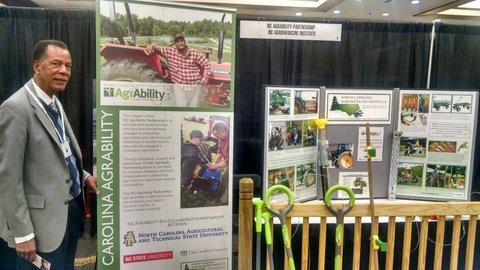 The North Carolina AgrAbility Partnership (NCAP) participated in the Global Rehabilitation Enhanced with Assistive Technology (GREAT) conference in Raleigh, North Carolina, from November 4-6, 2015. The international event drew more than 350 participants including university faculty, researchers, professionals, farmers, vendors, students, and private citizens. The conference featured seminars, interactive sessions, workshops, displays, vendors and student posters. NCAP partners attending the GREAT conference included Tammy Koger, North Carolina Assistive Technology Program and one of the conference organizers; Robin Tutor-Marcom, NC Agromedicine Director; and NC A&T State University faculty John Paul Owens, Dr. Godfrey Gayle, and Christopher Harrison. In addition to the NCAP and NC Agromedicine displays, the student poster session included six NC A&T State University students presenting their work "Modular Wall for People with Limited Mobility" and "Vegetative Sensory Gardens."